For many ward nurses, seeing a patient begin to deteriorate can be extremely worrying and stressful. In most hospitals support comes from the expert nurses who work in critical care outreach teams. ‘These are the sickest patients in the hospital and we make nurses, not doctors, the first line of defence,’ says John Welch, nurse consultant for critical care and outreach at University College London Hospitals NHS Foundation Trust (UCLH). doctors, the first line of defence. 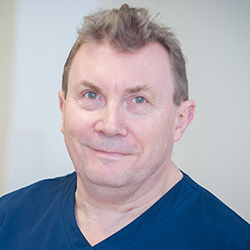 Mr Welch, who was instrumental in setting up one of the first of these services at Kingston Hospital in Surrey, joined UCLH’s existing service in 2009. 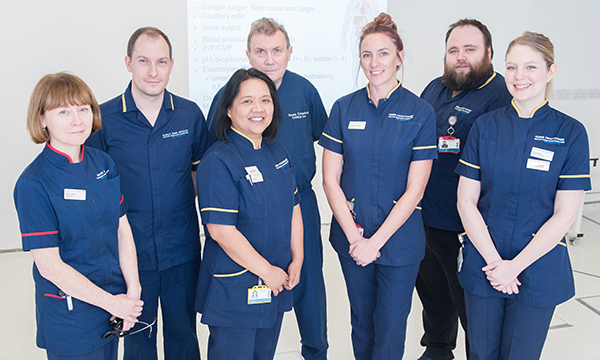 Around four years ago they were joined by colleagues working in resuscitation and are now called the patient emergency response and resuscitation team (PERRT). Today, 19 nurses – the majority of whom are band 6 – provide prompt critical care to patients whenever it’s needed and wherever they are in the hospital. 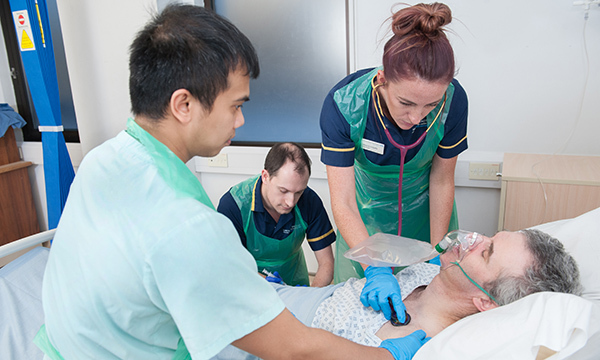 ‘The creation of the critical care outreach role in the UK is the most important development in acute nursing, certainly in my working life, yet it’s not very widely celebrated,’ says Mr Welch. Critical care outreach teams began in the UK in 2000, based on an idea that originated in Australia. Their creation followed research that found patients admitted to intensive care from hospital wards had much worse outcomes – including being two to three times more likely to die – than those from the emergency department or operating theatre. Other studies showed that some patients on wards had sub-optimal care, with deterioration going unrecognised, unreported or untreated. ‘The reports were a revelation,’ says Mr Welch. In practice, the team usually takes referrals from ward staff on the basis of defined physiological triggers, with UCLH using the National Early Warning Score (see box). The team also encourages staff to get in touch if they are worried. ‘We aren’t dismissive of concerns and sometimes we will stay and help, even if the real issue is that the patient just needs to be sat up in bed so they can clear their chest,’ says Mr Welch. He believes that when services like this began, some ward staff felt intimidated rather than supported. 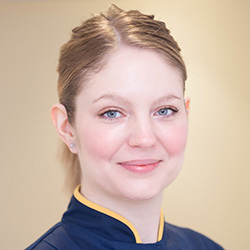 With a background in haematology, oncology and intensive care, Anna Welch (no relation to Mr Welch) joined UCLH in October and is one of the team’s ten band 6 nurses. ‘I remember being a ward nurse and how pleased I was to see the critical care outreach team arrive after they’d been called for help,’ she says. the critical care outreach team arrive. Around a quarter of the patients the team sees will be moved to intensive care, while the rest will continue to be managed on the wards. Working alongside the ward staff, the team also brings local knowledge. This includes where equipment is located within the hospital and what they know about a particular ward, assessing who is on duty, the skill mix of the staff and the likely needs of other patients they are looking after. In a service that is focused predominantly on saving lives, recognising when that’s not the best course of action is among the challenges. ‘Around one third of patients in hospital are in the last year of their life,’ says Mr Welch. He would like to increase patients’ understanding of what it is like to be treated for a severe illness, encouraging them to think in advance whether they want to be transferred to intensive care, with all that it entails. ‘It’s probably a debate that we need to have as a society,’ he says. from left), Rebecca de Souza (standing next to him), and Anna Welch (right). An audit of the service’s results shows that the team is getting it right about 93% of the time. Its figures demonstrate that patients are admitted to intensive care in a timely way, and those managed on the wards are on average getting better 24 hours later. If a patient dies, it is predicted and dignified, with a ‘do not attempt resuscitation’ order in place. In addition they monitor in-hospital cardiac arrests, which average one a week at UCLH, placing it in the best 10% in the country. They also evaluate readmission rates for patients within 48 hours of leaving intensive care, again doing better than the average. For Ms de Souza the impact on patient care and colleagues is the most important aspect. ‘You can feel at the end of your shift how much of a difference you’ve made to patients and staff, through your recommendations or a plan you’ve jointly put in place,’ she says. Broadly speaking, the service’s aim is to provide equity of care for all critically ill patients, regardless of where they are in a hospital. Typically nurse-led, teams may also include other allied healthcare professionals and doctors. Developed by the Royal College of Physicians in 2012 and revised last year, the National Early Warning Score (NEWS) is currently used by an estimated 70% of trusts in England, according to NHS England. It wants to see the system being used in every acute and ambulance setting by 2019, enabling NHS staff who move between trusts to have a consistent set of measures for diagnosing patients. This standardisation could potentially save more than 1,800 lives a year, says NHS England. The system is based on analysis of a large database of patients’ vital signs, recorded in different acute hospitals. In practice, a patient’s vital signs are measured then compared with a set of reference values. For NEWS, this includes their respiratory rate, oxygen saturation, heart rate, systolic blood pressure, level of consciousness and temperature. Measures above or below designated points are used as triggers for escalation, with improvement or further deterioration tracked over time.